Forty-four years ago exactly, college and university campuses across America exploded in violent and non-violent protests against President Nixon’s expansion of the Vietnam war. It was May 1970. Over the course of the month, the nation would witness more than 450 university, college and high school campuses being shut down by student strikes that involved more than 4 million students. It was the largest American student protest before and since. Kent State, Ohio, May 4, 1970. This is John Filo’s famed picture of Mary Vecchio over Jeff Miller’s dead body. 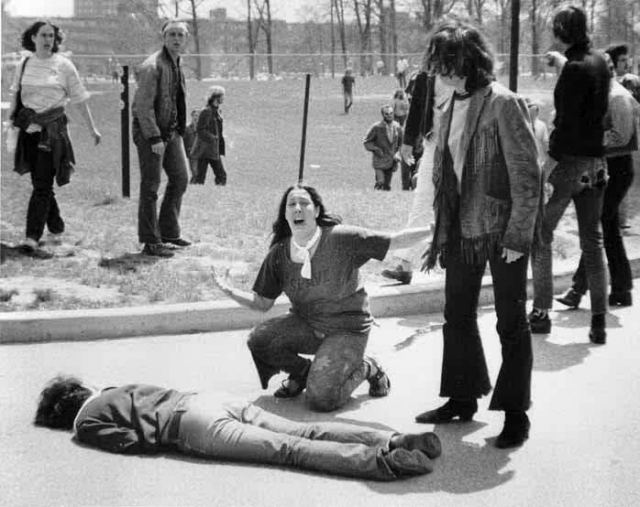 During protests, National Guardsmen killed four students at Kent State University on May 4, 1970 in Kent, Ohio, and Jackson city police and Mississippi state troopers killed one student at Jackson State College and a high schooler passerby, in Jackson, Mississippi on May 15. On May 8, ten days after Nixon announced the Cambodian invasion (and 4 days after the Kent State shootings), 100,000 protesters gathered in Washington and another 150,000 in San Francisco. Nationwide, students turned their anger on what was often the nearest military facility—college and university Reserve Officers’ Training Corps (ROTC) offices. All told, 30 ROTC buildings went up in flames or were bombed. There were violent clashes between students and police at 26 schools and National Guard units were mobilized on 21 campuses in 16 states. Hundreds of college and high school campuses across the United States were brought to a halt and millions of American students and other citizens united in protesting the continued American war in Vietnam and the authoritarian state that the country had become. It was one of the most catastrophic events in American history since the Civil War. It was a General Strike by students. And then on May 9th or 10th, UCSD student George Winne immolated himself in protest of the war. 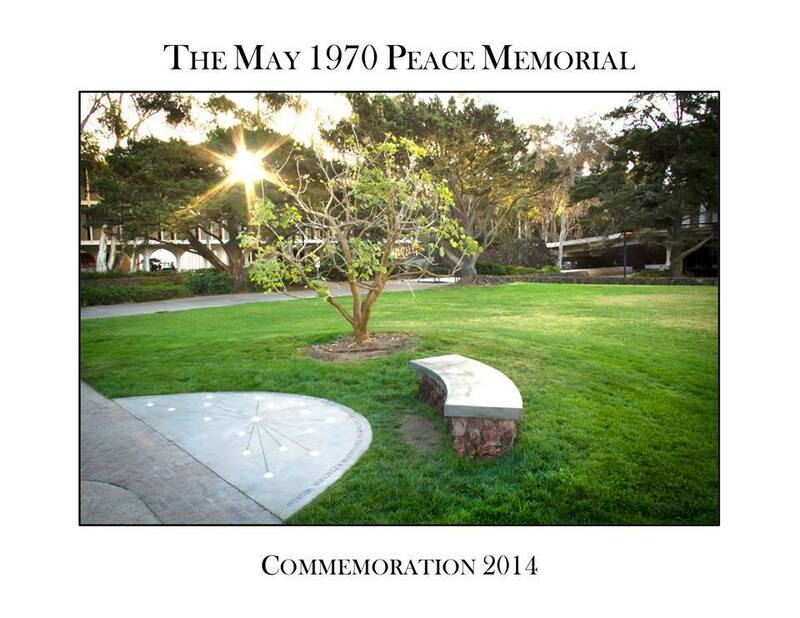 44 years later, students and faculty at UCSD, wishing to commemorate Winne’s action and the May 1970 Student Strike in general, have organized a Memorial on Friday, May 9 – this Friday – this year – to honor what happened. A Memorial Bench has already been installed, and at 3:30 pm, people will gather at the Bench to pay tribute to Winne and the student protesters of years past. All are invited. See this facebook pager about the event. Yet, outside of possibly some academic archives, there is not one single publication exclusively devoted to what happened during that cataclysmic month of May 1970. In 1980 I was wandering around UCSD below Central Library and ran across the plaque dedicated to George Winne in the middle of nowhere. A couple relatives have also spotted it over the years so I know it is still there. I vaguely recall hearing the students back then wanted a memorial in Revelle Plaza but Governor Reagan ordered it be put somewhere no one could find it. At my freshman orientation I recall hearing stories about UCSD being on the verge of being burned down. Iv’e also heard about grad student Angela Davis occupying a building and professor Marcuse being one of the first people to join her. I know a special collections librarian at UCSD. I should find out if they have information about these events. Jacobs and Viterbi (co-founders of Qualcomm) were professors at UCSD then and busy starting up Linkabit. I would be interested in reading an interview from them about that time period at UCSD. Between some of those events and the anti-semitism in La Jolla I bet they have some interesting stories. John, yes a long time ago, a plaque was installed way out in the woods. It’s clear the UCSD administration would just as well bury this whole episode where one of their students burned himself alive to protest a war they were involved in. I didn’t move to San Diego until August 1970 so wasn’t there during May, 1970. I would like to add that I was in New Haven, Connecticut the weekend of April 30, 1970 for a huge Free Booby Seale. At a meeting at the chapel there in response to the U.S. invasion of Cambodia, we called for a student strike with three demands: 1) U.S. out of Cambodia; 2) End all university complicity with the U.S. military and militarism such as war research, ROTC, etc., and 3) Free Bobby Seale and all political prisoners. Two days later, the four students were killed at Kent State and the mass student strike was in full-swing by the next day often with he demands that came out of New Haven. . I hope that in your commemoration, you include the protest at Jackson State and the murder of two students there later that same week. A future UCSD student, George Katsiaficas, examines this major student uprising in his excellent book, The Imagination of the New Left. Did you read this article and/or see our May 1970 Project website? Perhaps you can assist us in the project. I’ve heard from a number of former UCSD students who were there at this fateful time, and they’re glad this memorial is happening – “about time” one said. Many of them cannot be here, but they are here in spirit; thanks Roger, Judith, John, Randall …. The day Nixon invaded Cambodia a conversation started in the dorms at UCSD amongst student anti-war activists. We wondered how people would react if they heard that forces from the other side had invaded La Jolla and promised to go no farther than “21 miles” and promised to stay “no longer than 30 days” (references to the official U.S. government announcement about their invasion of Cambodia). Plans for the Yippie Invasion of La Jolla were born out of this conversation. The word went out all over Southern California campuses and business owners in La Jolla spent serious money to hire scores of Pinkertons to protect their properties. On the day of the protest, Memorial Day weekend, over 2000 people gathered at La Jolla Cove Park and then marched through the streets for hours, blocking traffic (no parade permit). 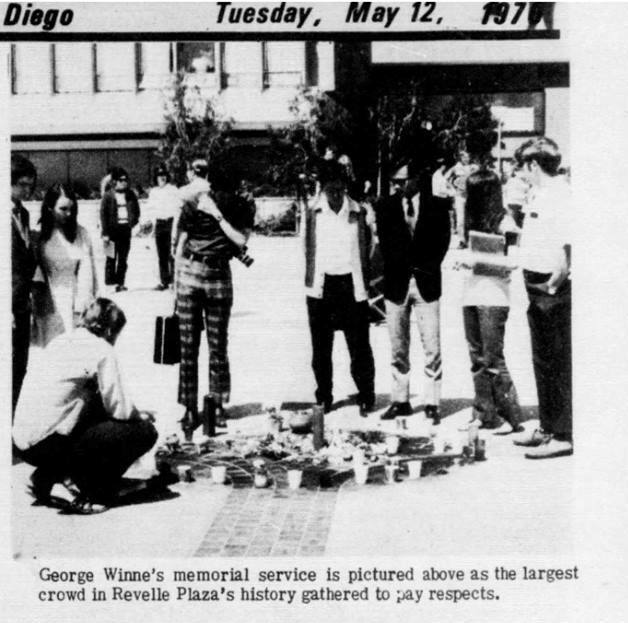 The day George Winne set himself ablaze at Revelle Plaza I was in my dorm room at Revelle College. A friend, and fellow anti-war activist stormed into my room saying he had just been at the Plaza and saw Winne do it. During the May-June 1970 National Student Strike, students staged sit-ins and we occupied 3 buildings at UCSD where war-related research was known to be conducted. We need good books to be written on this. Thanks for the good article. I was at UCSD from ’68 to ’72. Most of the noisy protesters were not UCSD students. The students were mostly quiet studious types. Nevertheless I wish that today’s students would protest the U.S. involvement in proxy wars all over the world. A recent Gallup poll showed that the bulk of Americans want the U.S. to its external activities. What you been up to? Hey, wanna go surfin’? But, back to the point…I agree with you that UCSD students were mostly quiet studious types. During the years you mentioned (1968-1972), even the protests reflected that approach, starting with the 1968 “Tuesday the Ninth Committee” that focused on confronting racism (internally and externally) in the aftermath of the assassination of MLK, Jr. The primary manifestations were study groups and internal examination and intellectual pursuit of solutions to the problems with occasional public protests. The SDS investigation into the role of UCSD in war research was a real turning point for many students, most of whom up to that point held a great deal of respect for the institution. When in 1969-1970 SDS broke into the UCSD Contracts and Grants office and stole documents proving that UCSD held contracts in the millions of dollars to conduct military and war-related research (exposing the lie the UCSD administration previously promulgated denying war reasearch was being conducted on campus), the respect for the University’s integrity was severely damaged. This betrayal of trust provoked a series of sit-ins around the issue of war research at UCSD. Even this protest was based on students’ own diligent and serious research into the issue, pinpointing the professors and offices used for such research. SDS even organized “welcome week” tours of these research offices to familiarize incoming students with the place that was going to train them. These were well thought out and serious protests. Although SDS made one concession to the Yippies when Byron King donned a barker’s hat, suspenders and cane to conduct the tours. 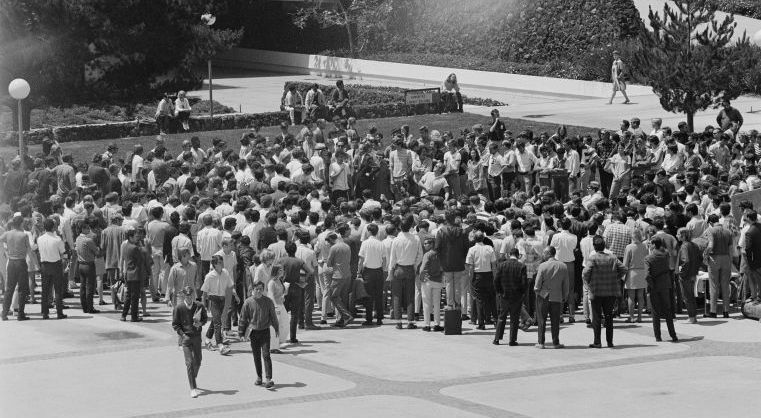 Once the killings at Kent State happened in May 1970, UCSD students filled to overflowing the Revelle cafeteria for a strike vote, joining, I believe, all the other UC campuses. In response, the Regents led by Gov. Ronald Reagan, shut down all the campuses and told all students to leave and go home. Apparently the Regents and Gov. Reagan believed by this time that too many students were against them. It was during that shut down that George Winne committed his final act. I had refused to go home, and I was on campus at the time. I doubt if the majority of UCSD students were out protesting the war, but I do believe that the vast majority of UCSD students opposed the war. Indeed, they were serious about it. So serious, in fact, that study groups researching the foundation of the war (capitalism, racism and imperialism) were begun as well as serious thinking and discussions that affected these students for the rest of our lives. Maybe yours too, just a little. After Kent State, a series of anti-war protests over the next couple of years (through 1972) at various facilities around San Diego brought out thousands of protesters. Most of these protests were organized by UCSD students and alumni. Yes, UCSD students were not particularly noisy as a whole, but their eyes were opened, and their education “took”. BTW, I was just kidding about the surfing. I can’t get up on the board anymore; so, I just boogey board instead. It’s almost as much fun. You up for that? Hey, here comes a set; catch you later. Here’s a 26-minute documentary about the 1968 San Francisco Student Strike. Enjoy!